Tucked nicely into the rolling hills of El Pinal, this is one of the last remaining affordable neighborhoods in North Evergreen. 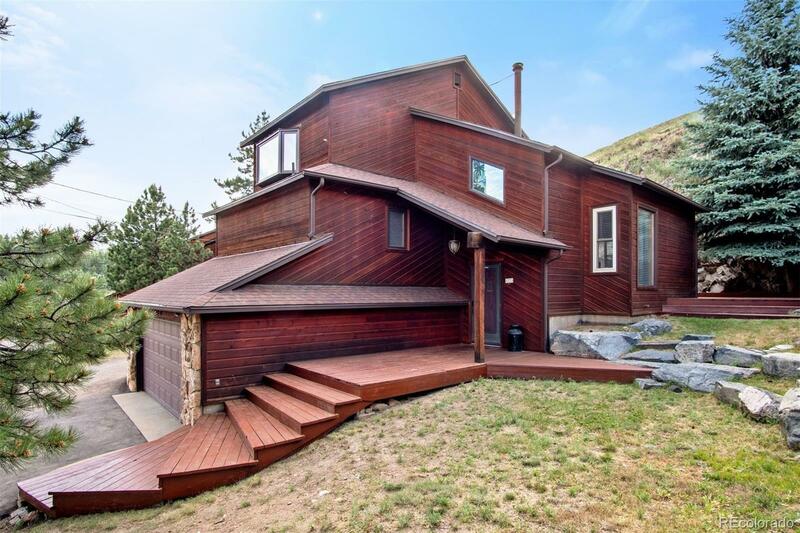 This home is conveniently located along a private county street just up the road from the well-known Evergreen Rodeo grounds. Grass covered lawn with a low cascading steps leads to the front door. An open stair rail gives a sense of space as you enter the house, with a high vaulted ceiling and a towering two story stone wall creating a dramatic impact to the living room and loft office. Well maintained kitchen has plenty of cabinetry topped with a slab granite counter, adjacent to the dining room surrounded by windows and accented by brick and mortar walls giving a country home feeling. The master and second bedroom are on the upper level with the third bedroom on the main. Lower level has laundry with access to the two car garage. Private deck in the back of the house with layers of rock formations that are displayed from the cut away of the hillside.